...the San Antonio Spurs! Tell me, Coach - how does Bogut fit with this Spurs team. COACH HUBIE: To answer that, I really have to go back to the Finals last June. The Spurs really had trouble with the Heat on two fronts. One, you've mentioned. Anytime Duncan went to the bench, there was no rim protection. LeBron would bide his time until 21 sat down, and then started taking over games. Tiago Splitter is a fine player and has improved every year he's been in the league, but he is not known as a defensive force. Boris Diaw couldn't get it done either. If the Spurs could arrive at a good place with Andrew financially, he would be a great fit on this team. XING: I think the finances will work since Boston will be paying part of his salary. And really, who would give up a chance to play with Tim, Tony, Manu, Pop, and the guys? If I'm Andrew Bogut, I say yes (maybe not if I'm his agent). The problem now is that the Spurs have an extra frontcourt player in the aforementioned Splitter. Time to fire up the Trade Machine! The Spurs are already playing more Boris Diaw that Tiago Splitter, so he's the logical choice. Splitter can't actually be traded until January 15, which is fine because Bogut can't be traded until April...after the trade deadline. Screw it. Even if it's done in the summer, the Spurs are getting Bogut. Splitter's contract is for $10mm over 4 years; since the Trade Machine won't let me trade him, I'll approximate his contract with a combination of Ginobili + Belinelli whose combined salaries total $10.2mm. XING: Holy Moses that's a trade! Coach Hubie, break it down! COACH HUBIE: The 2nd thing the Spurs lacked in their Finals series was a reliable ball handler behind Tony Parker. Manu Ginobili is still a great but his body has let him down. Danny Green had a great series but once the Heat forced him to put the ball on the floor, he struggled to make decisions in the middle of the half court offense. Jordan Crawford has shown great floor vision and ball handling this year and could be the perfect young player to bridge the older Spurs generation with the current one. COACH HUBIE: Utah, after extending Derrick Favors this summer, opted not to do the same with Gordon Hayward. Gordon Hayward is a fine player, but I don't think Utah is convinced he's an everyday starting shooting guard. XING: He's always been a great per-minute guy, but over the last four years, as his usage has soared from 15.3% to 24.5%, his True Shooting % (includes shooting percentages weighted for 2's, 3's, and FTs) has cratered from 57.8% to 49.9%. Meanwhile, Eric Gordon has consistently maintained a usage rate above 20% (22.6% this year), and his True Shooting % has never been below the 52.3% achieved during last year's injury-plagued campaign. COACH HUBIE: Utah is a young team that right now does not reliable options on offense. COACH HUBIE: Right. Giving some of those shots to Eric should help the team, as should surrounding Derrick Favors and Enes Kanter with another shooter. His ball-handling also gives Trey Burke an occasional break from point guard duties and may get Trey some open jump shots. XING: New Orleans clears a logjam of wing players, giving Jrue Holiday and Tyreke Evans the keys. They already made aggressive moves to obtain these two guys, they might as well run the team through them. Splitter is another useful pick and roll partner and I think fits well with Anthony Davis' versatility. And in Boston, Gordon Hayward is reunited with his college coach. Gordon is 2 years younger than Jordan Crawford and last year posted a PER of 16.8 compared to Crawford's 12.0. Of course Crawford is better this year, but if Brad Stevens can work miracles with Jordan Crawford, imagine what he can do with Gordon Hayward. The Spurs get better - the Machine says -4 wins, but remember, we're trading Splitter and adding Bogut, which is a net loss of 2.9 PER, but I think Bogut's defense really makes a difference. The Jazz get a well-regarded player that can also be used as a trade chip in the future. The Pelicans make more sense of their roster, and Boston turns back the clock to Butler 2009. Win win win win! COACH HUBIE: Paul Milsap is a terrific fit for the young Pelicans team that wants to make a playoff run. He is a much better defender than Ryan Anderson and can also defend small forwards. When he played alongside Derrick Favors in Utah, that defense was very tough to score on, and playing with Anthony Davis will provide the same effect. In Sacramento, Ryan Anderson gives the Kings a better shooter to put around Demarcus Cousins. Ryan has shot over 40% from three each of the last five years including this one, and helps give the Kings an identity. XING: For the Hawks, it's about flipping Millsap into a young asset in Goran Dragic. Millsap's name has been in trade rumors because of his favorable contract, but I actually would be fine with the Hawks keeping their team together - it's not a title team, but why trade early? I think ultimately the Pelicans will have to send the Hawks a first round pick to get this over the finish line. Dragic is a good passer that should fit with Jeff Teague like he has with Eric Bledsoe. And the Suns? The Kings will trade Rudy Gay with their own first rounder to get the Suns to take him off their hands. The Suns would love to get a first rounder for Dragic even though he's coalesced with Eric Bledsoe much better than anyone expected. Taking on the Gay contract and subtracting Dragic, Channing Frye, and Gerald Green only increases the Suns' 2014 salaries by $0.1mm (assuming Frye picks up his $6.8mm option, which he'd be smart to do). The trade also makes this year's Suns worse. Riggin' for Wiggins! Let's see who else I can fix. How about my favorite team growing up, the Chicago Bulls? Coach, tell me what's wrong the the Bulls. COACH HUBIE: Tom Thibodeau has done remarkable things the last several years with this Bulls team. Unfortunately, in the Eats, the Pacers have surpassed them and the Heat have also gotten better. The Bulls, even with a healthy Rose, desperately need a secondary creator. They also need salary cap flexibility as Mr. Jerry Reinsdorf does not want to pay the luxury tax to improve the team. They've grown a tremendous amount organically but a trade could do them well. XING: Let's give them one! This is what's going on: The Bulls send Boozer, his contract, and a protected first rounder to the Bucks for Ersan Illyasova, Ekpe Udoh, and Giannis Antetokounmpo. For the Bucks, it cleans up their frontcourt rotation giving them an optimal starting lineup of Boozer/Larry Sanders. Sanders makes up for Boozer's defensive deficiencies while Boozer becomes their 3rd best offensive player, someone that will make those around him better. The Bucks have made it clear they want to make the playoffs and Boozer will help. If it doesn't work? He's an expiring contract next year and easily flippable in next year's trade machine column. COACH HUBIE: In return, the Bulls receive two marginal frontcourt pieces and a young shooting guard in Antetokounmpo. XING: That is a handful of syllables for an announcer! COACH HUBIE: The Bulls will actually have to pay Illyasova about the same over 4 years as the Bucks will have to pay Boozer, but the annual impact is lessened after Udoh's contract expires. This gives them more flexibility in the free agent market. And Antentokounmpo is an exciting player that at 6'10", can fill multiple positions, just like Jimmy Butler and Luol Deng. XING: And Deng is the key. Deng has been in trade rumors for much of the last two years, and I just don't have the heart to trade him. Thibbs loves the guy and he gives them so much. I don't think he provides the same value to any other team. And personally, I love his game. He works so hard and plays so many minutes, I just can't trade him to a non-contender. This trade gives the Bulls some breathing room for the years to come when Antetokounmpo and Nikola Mirotic will come over. Rose will be back and this team will be good. It certainly doesn't help that, Thibbs willing, this year's team may get a better draft pick as well. ...just a small tweak. The Bulls don't need Taj, but the Kings now have two frontcourt starters in Demarcus Cousins and Anderson that don't give them anything defensively. Taj changes that. The Kings don't really need Derrick Williams' lack of shooting, but Bulls can take a flyer on his athleticism, and again, ability to play multiple positions (okay, play is a strong term). And if Thibbs make him better defensively? Lookout. XING: Okay, this is going to look a bit weird. 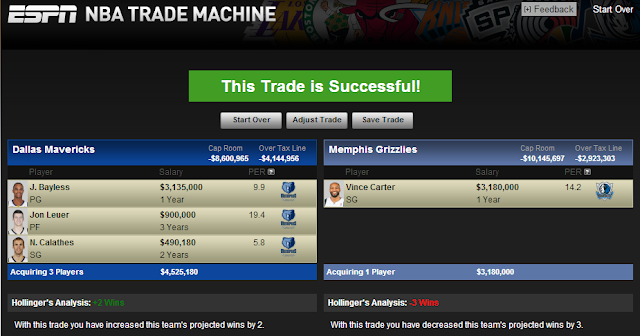 This trade is meant to be Vince Carter for Tony Allen, straight. Allen isn't eligible to be traded until January 15, so I plugged Bayless, Leuer, and Calathes' contracts in to show that is works financially. Coach, why does this trade work for both teams? COACH HUBIE: With the acquisitions of Monta Ellis and Jose Calderon this summer, Dallas has several capable ball handlers and creators at the guard spot. What they don't have is an above-average defender. With more and more talented point guards coming into the league, you need to have the ability to pressure the ball. Tony Allen may have lost a step, but he would still be Rick Carlisle's best option as a defender. In Memphis, they desperately need more shooting, especially with Marc Gasol out. Now Gasol is coming back, but to play with San Antonio and Oklahoma City, you need to have the ability to shoot the ball. Carter gives them that as well as secondary ball handling behind Mike Conley. His contract is also favorable, which is very important to the Grizzlies' ownership group. Philly moves Evan Turner and change (aka Lavoy Allen) for Steve Nash and Jordan Hill. Kobe Bryant claimed to love Evan Turner before the 2010 draft; now whenever Mamba comes back from his knee fracture, he can play alongside him. Turner has yet to reach his potential but has played better this year and could be a good ball handler in D'Antoni's system. What do you think, Coach? COACH HUBIE: Turner has the physical tools and decent court vision, but he needs to improve his strength and shooting. The 76ers have been in rumors linking them with Omer Asik. While Jordan Hill may look like poor recompense for not getting him, he has become a good defender and rebounder, something Philadelphia needs. XING: From a spending standpoint, the 76ers are taking some salary but they have ample cap room. Still, I think the Lakers send a protected first rounder to get this done; the Sixers' brass are too smart not to get that for taking Nash's salary off the Lakers. Coach, do you feel bad about sending Nash to a rebuilding team? COACH HUBIE: I have been good friends with Steve for a number of years. I and many of the people that have associated with Steve know him as a generous leader and teacher of the game. I think he will be priceless as a mentor to Michael Carter-Williams and will inject a positive attitude into that locker room. He doesn't need to win another game to be considered a Hall of Famer and one of the great points guards to play this game. XING: Michael Jordan has really struggled in Charlotte but things are looking better. In fact, they're a little too good; after tonight's win, they're 13-14 and the 5th seed in the East. I like the fact that this team is fighting and Steve Clifford is doing an admirable job. Coach, what has he done well? COACH HUBIE: Steve has done an incredible helping this young team. The key is knowing your personnel. He knows what type of players he has, what they do well, and where they struggle, and has enough experience to put them in positions to succeed. Remember: he has coached with both Van Gundy's, who were excellent coaches in their own right. Steve's teams play with purpose, intelligence, and hustle. Seldom are guys in the wrong spot or doing the wrong thing. So often, with young teams, the battle is consistency, and Steve is keeping things simple enough that the execution is good. XING: The most impressive thing he's done is get a team playing Al Jefferson, Kemba Walker, and Company to be the number 3 team in the league by opponent eFG% (found here). Perhaps more impressively is they are doing it by allowing the 3rd worse 2-point field goal %, meaning they're protecting the paint. I like the way this team is going, I like that they have two big expiring contracts in Ben Gordon and Ramon Sessions, and I hope they can be patient with the rebuild. This trade does a few things; Gerald Henderson is a good defensive player that is a bit inefficient offensively. The Wizards happen to need a better defender at the guard spot, one that doesn't require a lot of shots. Washington has basically given up on Otto Porter, Jr, and Jan Veseley while Charlotte can afford to take a flyer on young talent. The Bobcats should still be competitive for a playoff spot, though making the team a little worse this year doesn't hurt. What a way to end, a 4 team, 6 player deal! Miami sends Norris Cole to Toronto and James Jones to Portland for Kyle Singler. 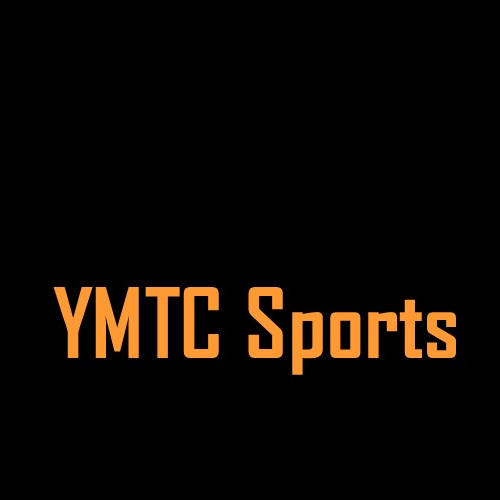 Toronto picks up a couple young guards for Patrick Patterson. Portland gets Patterson and Jones, sending Robinson to Detroit. Coach, take us home. COACH HUBIE: Miami don't want to take on too much salary but need backups for Wade and LeBron. Kyle Singler is a multi-dimensional offensive player that can play both guard and small forward. To get him, they have to give up Norris Cole and James Jones. For Portland, they receive a good defensive player in Patrick Patterson, and another 3-point shooter in Jones, who fits their high-scoring strategy. Thomas Robinson has been very inconsistent this year, and Patterson gives them consistency and rebounding. Robinson would fit well on a Detroit team that needs to develop some young talent. He could get some serious playing time there as a true power forward backing up Josh Smith. XING: Coach... we did it. There were some dark times there, endlessly tweaking things only for the Trade Machine to spit out "This Trade Failed." But we managed to create a trade for each of the league's 30 teams. But where do we go from here? What does the new landscape of the league look like? We have to take this to a Part 3 and Part 4. Part 1 is here.